Following our last two events during Pitti Uomo – the Shoemakers Symposium and the Tailors Symposium, we are following up with an event in January that will bring together some of the finest accessories makers in the world. On stage will be: Michael Hill of Drake’s, Benjamin Simonnot of Simonnot-Godard, Guillaume Clerc of Maison Bourgeat and others. The brands will also all have product on display around the Stefano Bemer atelier before and after. 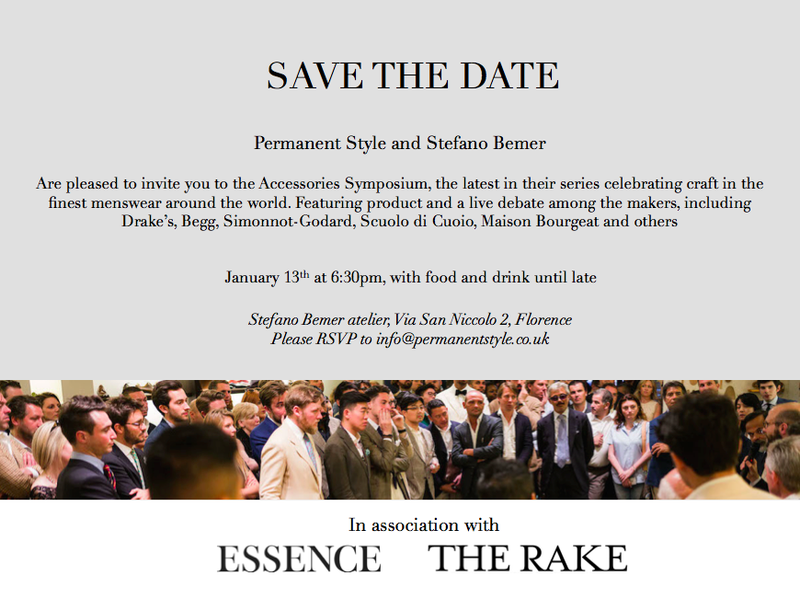 If any PS readers are in Florence and would like to come along, please email info@permanentstyle.co.uk. You can follow the discussion on The Accessories Symposium: Drake’s, Begg, Simonnot-Godard… by entering your email address in the box below. You will then receive an email every time a new comment is added. These will also contain a link to a page where you can stop the alerts, and remove all of your related data from the site. So 2016 will start with an introduction to the world best accessories! This is a very interesting initiative! Of course it would be helpful if beforehand you could provide a complete list of the makers to the many readers who can’t attend that event.